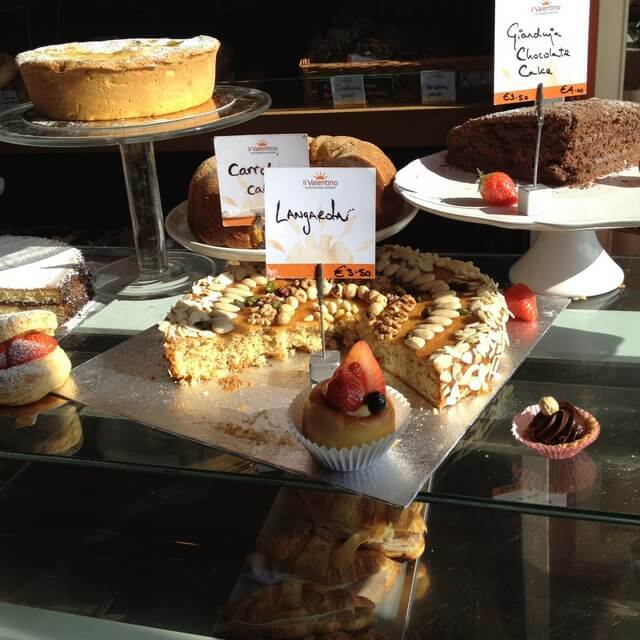 This day last week I joined a small group of Irish Food Bloggers on a visit to the Il Valentino Continental Bakery on the Grand Canal Docks in Dublin organised by fellow blogger, Clare from An American in Ireland. It was a wild and windy day but thankfully sunny and clear for a change when we all congregated outside of the bakery at a very civilised hour (for me) of 9.30am. I’ve had enough of this rainy, stormy weather this Spring let me tell you so it was a joy to be asked to pick a cake or pastry, a cup of tea or coffee and sit out in the sun to chat. I chose the moroccan orange cake which was made with breadcrumbs. The cake was delicious, moist, light and the citrus scent went very well with my lovely cup of tea made from proper tea leaves, something which can be hard to find in Dublin cafes, more’s the pity. Valentina Doorly, one of the owners of the bakery along with her husband Owen, sat with us and spoke to us about her passion for food, baking and how her love of pastry and bread wove through her corporate life before she left to join the team. I smiled outwardly and giggled inside at her description of turning up at meetings with crumbs on her collar and flour on her shoulder. This is the kind of person I can really identify with. We were then brought downstairs into the basement to the heart of the bakery where Owen, her husband introduced us to the baker and pastry chef. He was passionate about the philosophy of the Il Valentino team which is that bread (and pastry) making is an art that has been in decline. From the flour that makes our bread, to the manner in which it is made the best of baking has in recent history been modified to be convenient, fast and often full of preservatives, enzymes and chemicals to speed up what should be a slow process. Their bread contains just 4 ingredients; flour, water, yeast and salt. In the case of their sourdough bread it technically contains only 3 as their starter is of course made from just flour and water. By sticking to these core ingredients, proving their breads for a proper length of time (up to 3 days in some cases), employing staff with great skill and passion for their work (be it front of house or in the bakery) they provide consistently high quality products that are in great demand. Il Valentino have gone to great efforts to source premium products to make their bread and pastries with, from water which is put through a special filter not found anywhere else in Ireland, to the type of salt they use and the flour they bake with. Owen explained that despite the high statistics of coeliacs and gluten intolerant people in Ireland, they believed that the key was not in the amount of wheat eaten but more so in the manner and method the wheat eaten is treated. The bakery was filled with the scent of some freshly baked croissants and Morgan, the head baker shared them around to us all once they had cooled enough to handle. There were a few pain aux chocolat on the tray and I couldn’t resist picking one. The pain was light, crisp, crumbly and each layer was perfectly cooked. I wasn’t biting down on a crisp exterior yet doughy interior as can often be the case with supermarket bought pain. There are very few bakeries in Ireland that prepare breads and pastries to this standard. The food is beautifully made with not just skill but also passion which is clear in everything that they do. For me, it’s a pity that this quality comes at a price because as a foodie on a budget visits to Il Valentino will be confined to special occasions. This says a lot about the quick prove, quick bake method that is so popular in Ireland today. I’m still in the process of weaning the baby and so while some of the food bloggers got to hang around for another coffee and a chat afterwards I walked down the road to get the train home. Thankfully I managed to grab a quick shot of all the gang before I left. Many thanks to Clare for organising the trip and also to the team at Il Valentino for giving us such a warm welcome. Owen & Valentina Doorly, then the next person I’m not 100% confident on (somebody I’ve noted I’ll have to introduce myself to the next time we meet). In front then we have Clare behind is Kat. Beside Kat is Sharon & Bill in front of them is Niamh, behind her is Aoife, in front again is Joanna, behind her is Aoife, beside her is Lily and finally Rosanne. Yummy! My mouth was watering reading this, another place to add to my list for the next trip home to Ireland. A pleasure reading your blog and you are quite correct , it is the way the “wheat” is treated from the design of the seed through the multiple sprays while growing, then onto the fast track in large processing units where its pounded ,hammered and bleached, then you get the opportunity to eat this stuff .. Thanks Alfie it has certainly made me think about how wheat is treated before I bake with it. Great post, C. – sounded like a lovely day – I don’t know all those foodie bloggers, can you name them left to right cos I’m nosy!! Thanks Annemarie, I’ve edited the post above to list the bloggers & their names link to their blogs. I’m only missing 1! It was such a lovely morning Caitriona, a real treat and always a pleasure to meet people who are so passionate about good food.